In this episode of The Balanced Educator podcast, we’re interviewing Carolina Smith, a grade 1 teacher, Educalme Teacher alumni and Educalme Classroom ambassador from Calgary, Alberta, a second time! Carolina talks about her new business venture, the LIA project, a community of women finding ways to connect with themselves and each other. 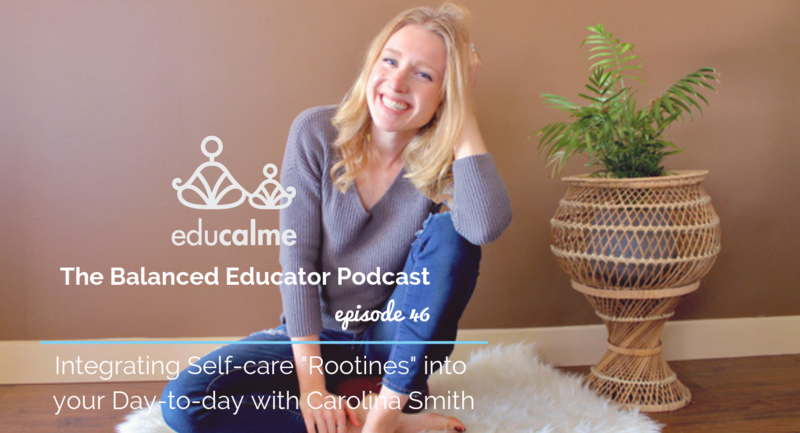 She shares what her self-care practice looks like and how she implemented her morning rootine since the Educalme Teacher course, and how she sprinkles self-care into her school day. She explains how affirmations have become an integral part of her morning rootine and how it’s been helpful in her day-to-day. She shares some of the challenges she’s had this school year and how she’s been managing them. She talks about how she’s created a great routine transitioning from work to home in the evening. She chats about the feeling of guilt and how she’s working toward moving past it. She shares her perspective of sick days. Connect with Carolina on Instagram @yogawithcarolina!